It seldom happens that the timbre of two instruments harmonizes as perfectly as in this recording. Unlike the bandoneon with its dominating octaves, or the accordion with its penetrating tones, the concertina remains discreet and allows the guitar ample scope to take a full solo role in their dialogues. 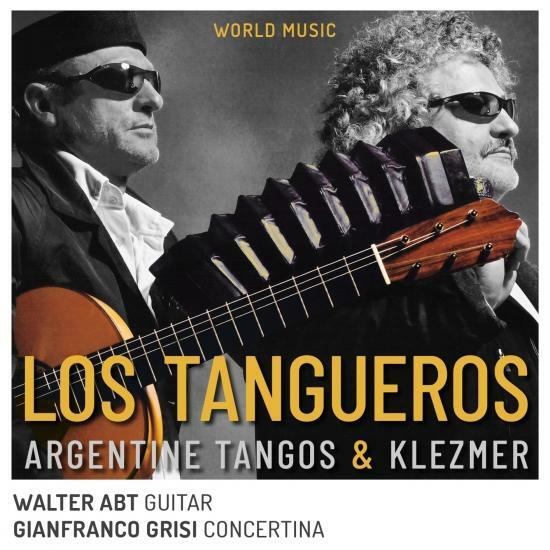 Harking back to the nostalgic charms of the tango as danced in the low dives of Buenos Aires, LOS TANGUEROS have unearthed some almost forgotten titles from turbulent 1920s Argentina and discovered the carefully dustedoff melodies from EI Choclo and the Milonga de mis Amores which are the true basis for the oeuvre of the great Astor Piazzolla. The programme presented in this recording intentionally avoids Piazzolla‘s own phenomenal pieces since they already exist in complete recordings by countless performers and in a variety of effective arrangements. The musicians here were concerned instead to explore the original tango forms, particularly the Milonga, and to recreate the authentic performing style. The four-movement Buenos Aires Suite by D. M. Pujol clearly demonstrates Piazzolla‘s enormous influence both on today‘s tango writing and on the stylistically groundbreaking, freer works such as the Preludio Matinal or La Gomavera, both by Walter Abt. The versatile guitarist and composer Walter Abt is remarkable for his flair and the delight he takes in discovering unusual and innovative musical avenues. His outlook was largely shaped by his collaborations with jazz and gipsy musicians. His performance repertoire and discography have earned him numerous awards and cover a broad spectrum ranging from Spanish and Italian Renaissance music and the classical guitar repertoire to flamenco and contemporary Latin American guitar music (viz. his pioneer records of Leo Brouwer´s music, sometimes with Brouwer himself, – or playing with the incomparable clarinet player Giora Feidman). Alongside his career as a soloist, Walter Abt is much in demand as a composer and arranger. His Concerto del Benaco owes its origin to a commission by the Italian province of Trentino, the area at the northern end of Lake Garda where Abt has chosen to live. Walter Abt was founder and leader of the Munich Guitar Orchestra and of the flamenco ensemble SOL Y SOMBRA, and was the founder and director of the summer school for guitarists which he set up at the Bavarian Academy of Music. He likes to surprise his audience with musical crests between classical music, jazz and worldmusic -as well as with ancient instruments like lute or vihuela. He is very welcome at numerous well-known international festivals.